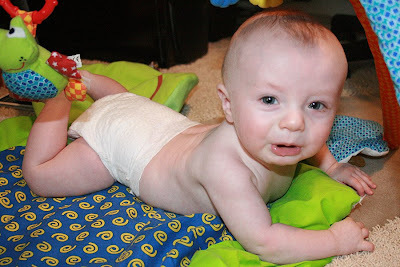 Milo has been practicing so hard on rolling over and he's getting really good at it, but I discovered, one hot afternoon, that if I would lay him down in just a diaper he got it a lot faster. I guess he can just move a lot easier with out clothes on. 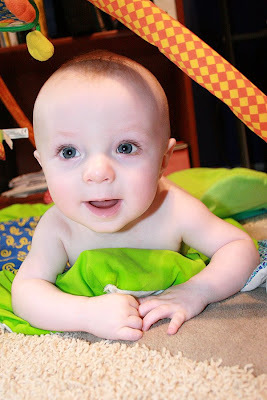 And besides he loves hanging out naked anyway, so, what the heck, whatever makes baby happy makes momma happy. He will get over onto his tummy and sometime he can't get back over when he wants to so he'll just lay there getting more and more agitated until I go and flip him over. The more agitated he gets the less able he is to flip back over himself. If he is happy however he can usually do it. It always seems to surprise when he does too. I snook up on him to get this pic. This is one the "Oh my God! I am on my tummy, how did I get here and how can I get back" freak outs. After he noticed that I was in the floor with him he got much happier. 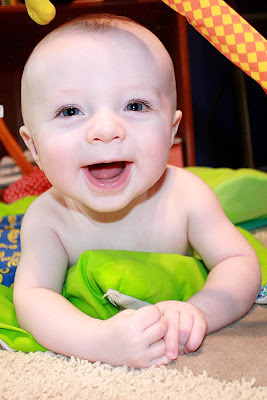 Isn't that the best smile ever!?! It just brightens my whole soul. I love making my baby laugh.